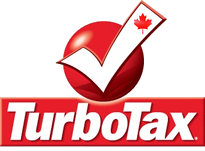 Save $22.00 Save $22.00 on TurboTax Standard, Canadian Version. Now get the 2012 online version of TurboTax Standard Canada now for just $17.77, over 50% off the boxed version which retails for $39.99. Exclusively available at intuit.ca, the new online versions of TurboTax Canada let you complete your tax returns from any internet connected wireless device (like your iPad). Your order of the Standard version lets you import all your e-tax slips, make claims for child tax credits, and help optimize your RRSP contributions. No promo code needed to purchase at the sale price. On Sale! 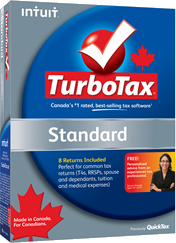 Find TurboTax Standard 2012 on sale at Amazon Canada. One of the best places to get a deal on TurboTax Standard and the rest of the 2012-tax-year versions are at Amazon.ca. As one of Intuit’s top resellers, they often have select versions on sale from 10% to 25% off the list price. On top of that, you’ll enjoy free standard super-saver shipping. Offers tend to vary daily so see their site for today’s latest sale price. This is arguably one of the best products dollar-for-dollar as it is packed with many solid features making TurboTax Standard edition all you need to file personal tax returns. I have to mention that individuals claiming deductions, charitable donations, tuition or medical expenses, and RRSPs will benefit the most from this product. If you fall out of this scope, TurboTax Canada has products designed to accommodate most tax situations. There are two ways to complete your return: traditional by entering all data manually, or automated by importing it from appropriate sources. Carry-Forward feature allows you to import your prior year’s return that already includes most of your personal information. TurboTax performs its standard questionnaire to verify that the information is current and to account for any major changes in your life. It also collaborates with some financial institutions and ePost so that you can import your slips directly into TurboTax and have it fill out the necessary fields. Before you file Standard editions checks for accuracy and potentially missed deductions. Automation is completed with NETFILE and receipt of your refund in just days. This program lets you work at your own speed and bookmark sections you want to return later. It is equipped with support via chat, email, phone, or users’ community. TurboTax Deduction Toolbox lists all deductions and credits you qualify for from A to Z and explains each one of them. You can easily adjust amount you contribute to the RRSP, split pension income with your partner, and receive helpful tips on how to save even more the following year. You can also purchase Audit Defense option so that in case of a CRA audit, you have a professional represent you and handle all CRA inquiries. If you want to import your data directly from epost and do some scenarios to better decide how much to put in your RRSPs don’t bother with this! It doesn’t work for me… and according to their customer service, it won’t be available until march 3rd… once it is too late for RRSPs.